I do realise that this is a dried flowers blog, which is not the same as gardening, however my garden supplied endless inspiration for my projects! 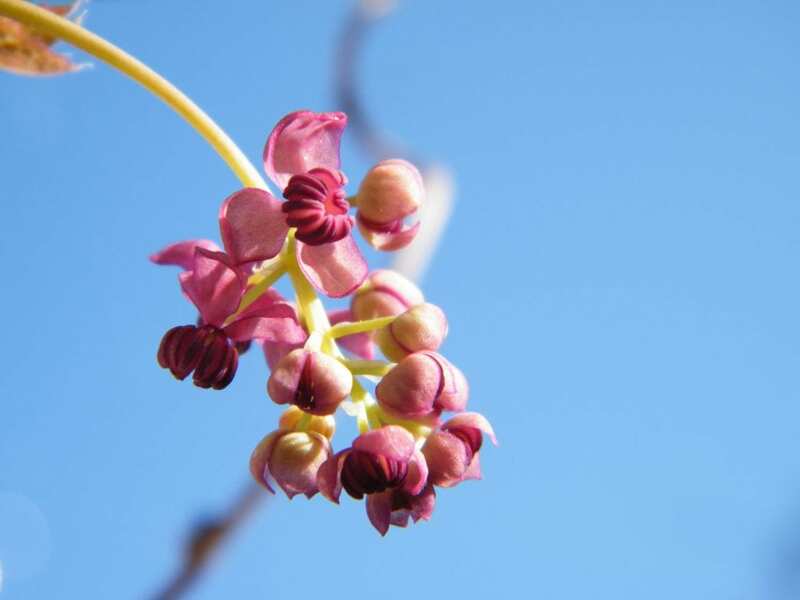 Here are some of my favourite garden flower photos this month. 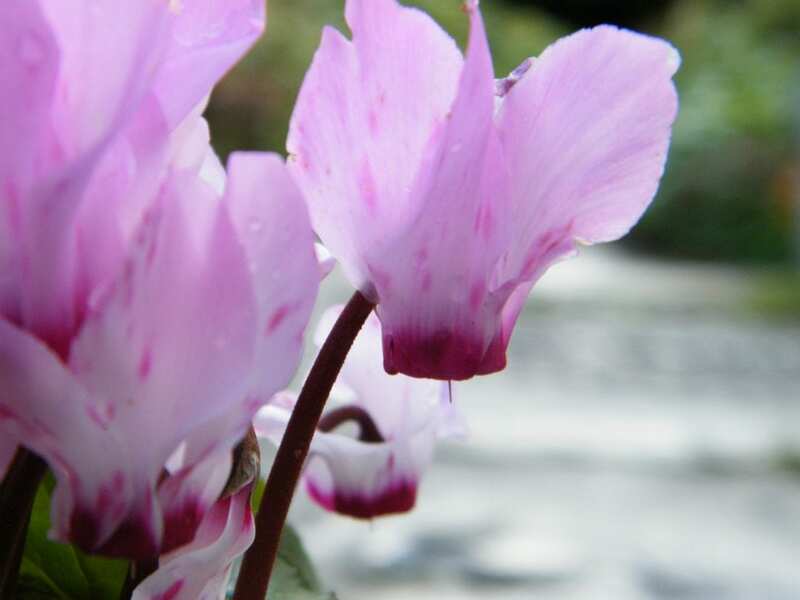 Reliable cyclamen have been flowering on the patio in my garden in the rain ever since Christmas. 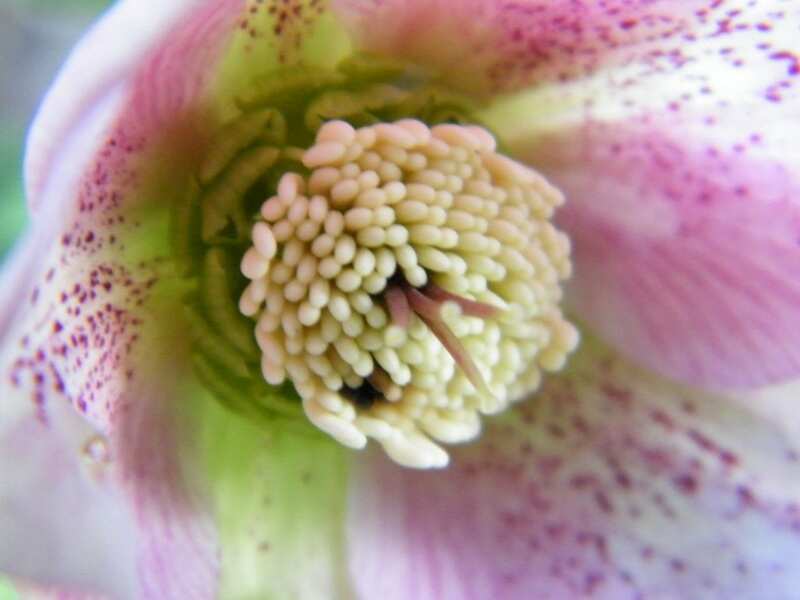 Detail inside a hellebore flower in my garden, taken mid-month. Mike bought me some lovely fresh flowers this Valentines Day, and I displayed them alongside some of my dried flower projects near my front door. From left to right in the image below are: hydrangeas grown in my garden and dried 2012; paper roses – can’t take credit for those because I bought them; glass dish with garden flower petal potpourri made with Nicola Stocken; fresh roses & tulips; blue and white bowl containing homemade sweetheart potpourri; goblet filled with dried flowers from my garden rescued from Christmas baubles project; handmade cinnamon and orange potpourri; dried hydrangeas from my garden 2013. Earlier in the month I wrote a post about using rose petals for Valentines day, and used a vintage image as a base for a dried rose decoration. The roses in the latter again came from my garden and were dried flat. The Herb Society is a great group of people who get together regionally around the UK to celebrate all things herbal, including growing, cooking, medicinal, craft and cosmetic uses as well as the historical background to the popularity of these plants. I have been a member for some years an am pleased to be getting more involved with them by helping with their social media. So if you have been enjoying my posts on lavender, chamomile and roses, check us out at Facebook.com/herbsocietyuk , Twitter.com/herbsocietyuk and Pinterest.com/herbsocietyuk with new blog coming soon. Earlier this month, for security reasons I made changes to ways this blog can be followed – read more in my post. Well this morning the sun is shining through the rain, and the daffodils have fat flower buds, so I am full of optimism for the month ahead! Beautiful photos, Ruth. I love the springtime theme going on here, as it draws us out of this horrid wet winter we have had! Hi Gail, Thanks for commenting! I think I was inspired by the sun shining here this morning – fingers crossed it lasts!